The Brownie Baker, a family-run business, has experienced great successes since we started in 2011 at the Cornwall Food and Drink Festival. Here we premiered four of our sumptuous brownie flavours to rave reviews. Since then we have won lots of awards and recognition for our chocolate brownies, all of which are carefully handmade in our cottage in Cornwall. 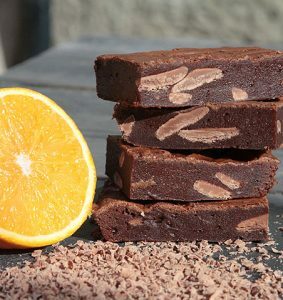 In 2012 at the Cornwall Food and Drink Festival we released two more delicious brownies – the Cherry Brandy Brownie and the Orange Brownie. These received excellent reviews. Our brownies have now been tasted by celebrities including, TV chefs Clarissa Dickson-Wright, Rick Stein and Mary Portas. At the Royal Cornwall Show we had a visit from the Duchess of Cornwall who was very interested in how The Brownie Baker had started. The secret to our success is simple – we only use the finest locally sourced ingredients, and each brownie is lovingly handmade to deliver the ultimate in flavour. Cornwall is renowned for its food and it’s wonderful to be a part of it.